If you share your life with a budgerigar, also known as a budgie or parakeet, you probably keep him in a cage and occasionally let him out in a closed-off room to enjoy a little flight time. In his native Australia, your budgie's wild cousin might live in a huge flock, migrating seasonally in search of water and food. The adaptations of budgerigars in captivity are such that their lives have little in common with the wild variety. Wild budgies might live as long as 15 years in their natural environment, but that's the exception. Most live only three or four years, victims of predators ranging from snakes to humans. Domestic budgies can live as long as 21 years, although the average life span is between five and 10 years. You can help your budgie live longer by ensuring he receives a healthy diet and regular exercise. Although your bird can't live in a large flock, budgies are social creatures and do best with parakeet companions. Wild budgies live on grass seeds, along with insects and berries and fruits in season. Foraging takes place on the ground, with the birds removing seed hulls before consumption. Budgerigars require a great deal of water, so wild flocks stay near water sources. Domestic budgies typically eat commercial parakeet feed, designed to meet the bird's nutritional needs. Wild budgies trim their beaks by chewing on wood. Provide your budgie with a cuttlebone or wooden toys for his chewing needs. In the wild, budgies breed between June and September -- wintertime in their native Australia. Birds can reproduce about the age of 6 months, breeding in colonies. Nests are generally in large trees, relatively close to each other. While wild budgies lay between five and six eggs, the number for captive birds ranges between four and eight. Domestic birds lay their eggs in nest boxes inside their cage. Approximately three weeks after laying, hatchlings emerge from the eggs. In the wild, chicks are weaned and out of the nest between the ages of 6 and 8 weeks. Domestic chicks take somewhat longer to wean. Wild budgies are predominately green, with dark markings and striping and blue tail feathers. Breeders have taken advantage of color mutations in the species to produce a variety of shades. 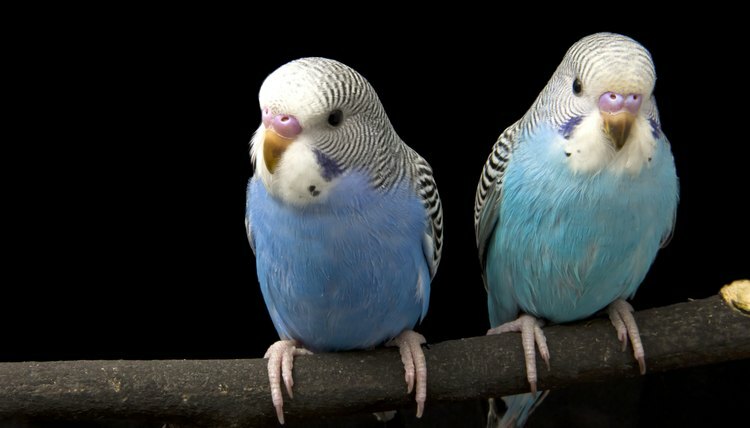 There are 32 primary color mutations in budgies, which affect feather color and patterning. The latter includes clearwings, lacewings and greywings. Colors fall into two basic categories. White includes shades of gray and blue; yellow includes green, yellow and grayish-green. With various mutations and dilutions, you can find domestic budgies in shades ranging from cinnamon to violet.